Twelve stories set in Bangladesh, Sweden and the Middle East. A young Bangladeshi mother loses her newborn in a European hospital, then has to assert her religious identity in an alien environment. A diaspora Bangladeshi returns home to the full force of culture shock as she confronts the tradition-bound Imam who appears to hamper her wish to tend her father’s grave. A respectable Bangladeshi man sexually abuses his maidservant. A five-year-old girl in time of the Lebanese Civil War kills her brother. 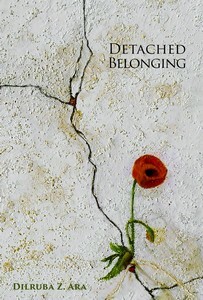 Detached Belonging is an assortment of accounts of human lives. Ara reveals the bizarre that lies beneath the ordinary ‒ all with her characteristic poise and grace.